Congress MP Vivek Tankha claimed there was no electricity in a strong room in Madhya Pradesh's Bhopal city for over an hour during which the CCTV cameras had also stopped functioning. 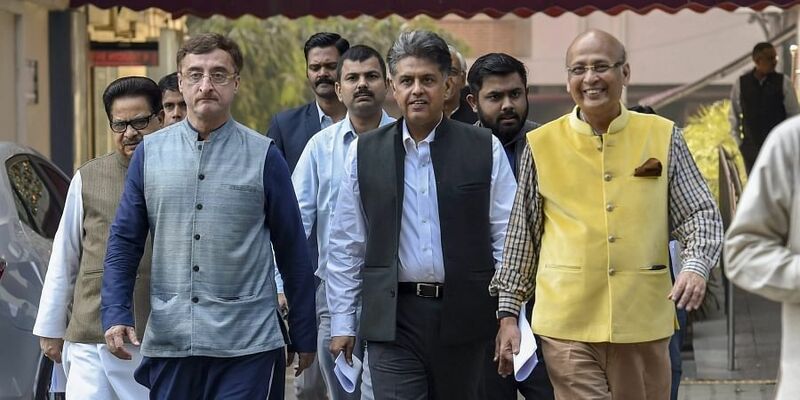 NEW DELHI: A Congress delegation met the Election Commission Saturday and raised concern over the security of EVMs inside strong rooms and their handling during the counting process in Madhya Pradesh and Chhattisgarh, and the alleged deletion of voters in Uttar Pradesh. Talking to reporters after meeting the Election Commission, Congress leader and AICC's Chhattisgarh in-charge P L Punia said suspicious activities were being reported in the Dhamtari Assembly seat in the state. He claimed suspicious people with laptops and mobile phones were seen around the strong rooms, where Electronic Voting Machines (EVMs) were kept after the voting, on the pretext of repairing the CCTVs. The party has also lodged a complaint with the Chief Electoral Officer in Raipur regarding this, Punia said. He also claimed that 48 hours after the closing of polls in the state, a school bus bearing no number plate and carrying EVMs had reached the Sagar district collector's office. "The objective of this was ostensibly to deposit these machines with the office of the collector. These spare EVMs were to be deposited two hours after the polls and not after two days. This happened in the Khuria seat from where the state home minister is contesting the polls," Tankha told reporters. Senior Congress leader Abhishek Singhvi alleged that in Uttar Pradesh's Sarhanpur district there were discrepancies such as erroneous deletion of names of voters on booth number 44. He said glaring anomalies were found in 98 of the 100 forms on this booth and names of people of a particular community were being deleted so they could not vote against the ruling party. "The Election Commission has assured us that they will look into it," Singhvi said.